We use butter in most applications while in culinary school, especially since the school is french based. The other day, I was whipping cream to make a mousse and turned away to help another student and my cream instead of becoming whipped, became butter!!! Sweet cream butter Butter made from pasteurized cream that contains at least 80% milk fat. Unsalted is preferred for baked goods and with seafood. Salted is better as table butter. Both can suffice for general cooking, although unsalted is preferable. European-style butter Butter made from cream churned slower and for a longer time than standard butter. 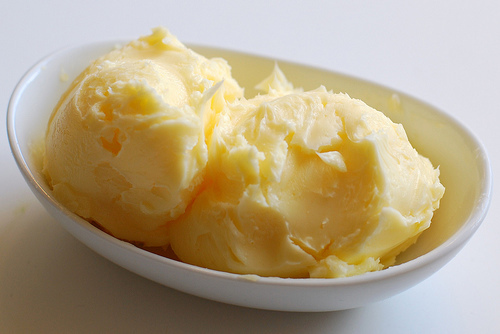 Butterfat content is higher (at least 82%) compared to standard butter. Higher butterfat enables cooking and baking at higher temperatures without burning. Whipped butter Butter with air whipped into it, which increases volume and spreadability. Good for toppings and spreads. Compound butter (finishing butter) Butter blended with herbs, spices and other seasonings. Great for adding flavor to finished dishes or spread atop warm bread or crackers. Cultured butter Made from cultured sour cream. Good for baking, since the lower moisture content results in flakier pastries and fluffier cakes. Clarified butter (drawn butter) Purified butterfat. Butter that’s been melted and made clear by separating and discarding the milk solids and water. Clarified butter has a high smoking point, making it a good base for sauces.